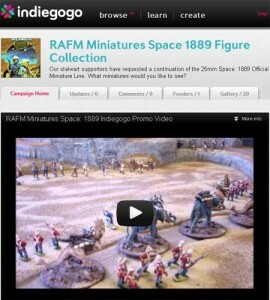 RAFM Miniatures has launched an IndieGoGo campaign for their Space 1889 figures line. RAFM Miniatures has been producing Space: 1889 Miniatures since the game's inception in 1988. The line has met with critical success but needs to undergo major improvement to bring it up to current standards. Due to the success of Victorian Science fiction and the Steam Punk genre we have anticipated a growing demand for new miniatures in this line. Contributors will be able to help guide the expansion of this line to provide gamers with a true piece of science fiction history.